Have you ever wondered what art is all about? Aside from being beautiful, what purpose does it serve? It acts as a constant source of encouragement for our better selves. These positive ideas may inspire you to head out to the gallery, but how will you know what to look for once you're there? Here are some ways to help you understand what you see and possibly even improve your appreciation of paintings, drawings and sculpture. Long before modern technology existed, people used pencils, brushes, bronze and stone to create art everywhere...from permanent wall paintings in caves to portable carved statues. These treasures date back to prehistoric times, but people were probably producing some forms of art even earlier. When was it painted or sculpted? Why was this painting or sculpture made? Where was the artwork originally displayed? Where should you stand in relation to the painting or sculpture? Does it matter whether you like or don’t like the painting or sculpture? Over the centuries, painting styles changed as each generation found new forms of expression. Even when the subject matter was the same, each artist had a different way of looking at it. Most early paintings in Western art were biblical in nature and were painted for the Christian church. Many well known Jewish stories and characters were featured in those early paintings. For instance, in the Gothic ages (1200s and 1300s), virtuous Jewish women (like Esther, Miriam, Ruth and Rebecca) and visionary men (like Abraham, Jacob, Noah and the prophet Isaiah) were often chosen to represent qualities that the Church valued. As painters started to test the restrictions of their patrons in the Church, they began to focus on biblical characters that gave them the chance to emphasise physical strength and beauty. Beautiful and chaste (but mistreated by two elderly judges), Susanna was frequently depicted by some of the most famous artists of both the Renaissance (late 1300s to early 1500s) and Baroque (early 1600s to early and mid 1700s) artistic periods. By considering this simple example, you can understand how art is not only a history of changes of style and subject matter, it also tells us something about how attitudes and people change over the centuries. Daniel Moritz Oppenheim (1799-1882) is thought of by some as the first Jewish painter. Oppenheim was a German Jew whose work drew on his Jewish experience. His paintings portray a variety of scenes from Jewish life, including people attending weddings, families gathering for Shabbat and rabbis studying. Camille Pissarro (1830-1903), the famous French Impressionist, was born on the island of St Thomas (then in the Danish West Indies) to a French Jewish mother and a father of Portuguese Jewish descent. His subject matters are not specifically Jewish in nature, and his paintings are mostly of urban settings. Amedeo Modigliani (1884-1920) was born in Livorno, Italy, to a successful Jewish mining family that lost its fortune when the price of metal plunged. Working primarily in France and influenced by the unconventional art scene in Paris, he often painted faces and figures in a very distinct, elongated style which he also illustrated in his sculptures. Marc Chagall (1887-1985) was born to a poor Hassidic family in Vitebsk, Belarus. In 1910, he moved to Paris in order to build his creative style. Chagall’s work incorporates imagery from his youth, folk images of life in the village and references to the Torah. Using oils, watercolours and gouaches, he incorporated the styles and techniques of the Parisian art scene while expressing and identifying with his Jewish background. Rembrandt lived in the Jewish Quarter in Amsterdam on the Breestraat, first from 1633 to 1635 and again from 1639 to 1658. During that time, Rembrandt was friendly with two Sephardic Jews; one was the physician Ephraim Hezekiah and the other was Rabbi Manasseh ben Israel. Perhaps as a result of these friendships, Rembrandt painted many Jewish biblical scenes like Balthazar's Feast, Jeremiah Lamenting the Destruction of Jerusalem, Jacob Blessing the Sons of Joseph and, of course, Susanna and the Elders. "When I lived in London, I would visit the National Gallery, and the paintings that I loved the most were those of Rembrandt. In my opinion, Rembrandt was a saint. 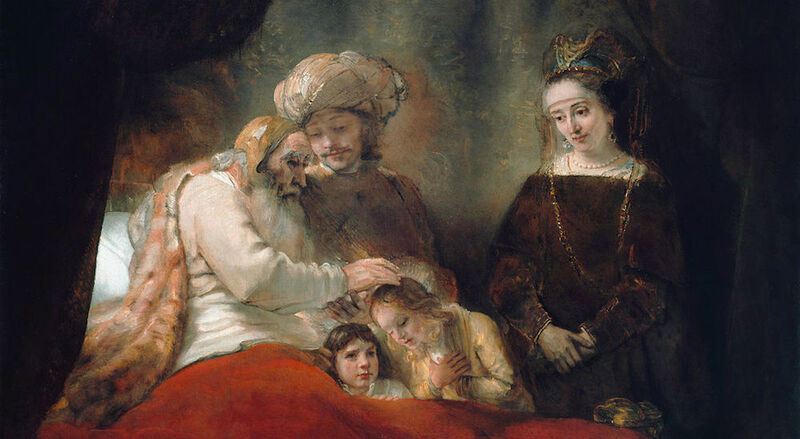 When I first saw Rembrandt’s paintings, they reminded me of the rabbinic statement about the creation of light. When G-d created the light, it was so strong and luminous that it was possible to see from one end of the world to the other. And G-d feared that the wicked would make use of it. What did He do? He secreted it for the righteous in the world to come. But from time to time, there are great men whom G-d blesses with a vision of the hidden light. I believe Rembrandt was one of them, and the light of his paintings is that light which G-d created on Genesis day." When you think about sculpture, your first thought might be of iconic statues like David by Michelangelo or The Thinker by Rodin, or it could be famous landmarks like Lord Nelson atop his column in Trafalgar Square or the Statue of Liberty in New York. In truth, sculpture has a very long history that traces back to man’s earliest times. The first sculptures were made to resemble ancient deities and animals. But from roughly 500 BC to 200 AD, Ancient Greek and Roman artists moved away from these formal depictions to capture regular human subjects (like charioteers and athletes) in more natural poses. As with the history of paintings and drawing in Western art, many of the first great sculptures in Western art—especially during Renaissance and Baroque times—were also based on characters and scenes from the Bible. Jacob Epstein (1880-1959) pioneered modern sculpture. He was born in the United States to Polish Jewish refugees, and his first major commission was a depiction of the American journalist Hutchins Hapgood’s Spirit of the Ghetto. Epstein used the money from this commission to move to Paris in 1902, and he eventually settled in England in 1905. Much of his work, including his tomb of Oscar Wilde, was considered controversial, but his creativity influenced many future artists. Max Finkelstein (1915) is a sculptor and multimedia artist from New York City. Trained as a machinist, he experimented with carving and welding in the 1950s and features biblical themes along with natural concepts in his work. Viewer participation is often a very important part of his creations, which come to life when the viewer sets them in motion. Frank Meisler (1929) was born in Danzig, Germany (now Gdańsk, Poland) and came to England in 1939 on the Kindertransport. Meisler studied architecture before moving to Israel in 1960, where he has a workshop in the old city of Jaffa. He has created many noteworthy sculptures, including Kindertransport - The Arrival for Liverpool Street Station in London. Ron Arad (1951) is a sculptor, architect and industrial engineer who was born in Tel Aviv. He attended the Bezalel Academy of Arts and Design in Jerusalem and the Architectural Association in London. His Thought of Train of Thought is a giant, twisted, rotating blade of aluminium in London’s St Pancras station. He designed it to welcome visitors and perhaps even calm them down. Anish Kapoor (1954) was born in Bombay to a Hindu father and a Jewish mother whose family emigrated from Baghdad. His mother’s father had been the chazzan at the synagogue in Pune. In the 1970s, he moved to Israel and lived on a kibbutz; he eventually decided to become an artist and moved to England. In 2010, one of his sculptures was commissioned and installed at the Israel Museum, Jerusalem. Kapoor has also designed stage sets and architectural projects. If you'd like to find out more about art, there are many sources. With just a bit of background information and a curiosity, you may be ready to head out to put your newly acquired knowledge to work. Just keep in mind, the best time to visit is usually early in the morning when museums have first opened and are not so crowded. You can try to avoid weekends or school holidays, but you will almost always come across school groups and tours, no matter what day of the week you visit. It is always worth contacting the gallery or museum before your visit to find out about concerns you may have over access and mobility. If you do have concerns, ask if the museum can make special accommodations ahead of time so you can get the most out of your trip. Many museums offer a range of accessibility options, so don't be shy! If you are especially interested in seeing 20th century Jewish art, you could visit the Ben Uri Gallery and Museum in London. Originally called The Jewish National Decorative Art Association, the gallery was founded to support and nurture art and creativity. The museum holds masterworks by Frank Auerbach, David Bomberg, Marc Chagall, Jacob Epstein, and many other important artists. Finally, if you want to find out more about what it takes to become an artist, visit our section on Being Creative: Fine arts.